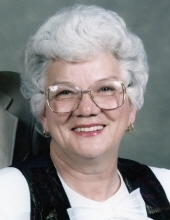 Mrs. Barbara Baines, age 81, of Rockmart, GA passed away Friday, November 23, 2018. She was born in Cedartown, GA on March 23, 1937, a daughter of Henry and Mattie Timms McBurnett. Mrs.Baines had been a resident of Rockmart since 1955 moving here from Hiram, GA . She was a 1955 graduate of Rockmart High School and also graduated from Reinhardt College. She began her career in banking with the former Rockmart Bank and retired in 1992 from Sun Trust Bank. Mrs. Baines was a member of the Second Baptist Church of Rockmart. She loved the study of genealogy and spent a great deal of time over the years researching her families roots. Mrs. Baines also loved to spend time frequenting yard sales. In addition to her parents she was preceded in death by a daughter, Roxanne Marie Baines in 1972 and by her husband, Leonard Baines, Jr. in 2010 to whom she was married on November 23, 1955. Survivors include a son, Randy (Martha) Baines, Rockmart; daughter, Bonnie Baines, Rockmart; grandchildren: Jane (Bobby) Waldrop, Rockmart, Nicole (Daniel) Ellis, Rockmart, Dillon (Jessica) Sharp and Rheanna (Blake) Mylius, Rome; great grandchildren: Trudi Baines Ellis, Brystol Waldrop, Carter Waldrop and Maddox Sharp. Funeral services will be held Tuesday, November 27, 2018 at 3:00 pm in the Second Baptist Church of Rockmart with Rev. David Warriner officiating. Interment will follow in Rose Hill Cemetery. Pallbearers will include: Bobby Waldrop, Daniel Ellis, Ross Baines, Ricky Baines, Mike Baines and Donnis Baines. Chuck Garrison and Shane Garrison will serve as honorary pallbearers. The family will receive friends Tuesday from 1:00 pm until the service hour at the Second Baptist Church. The Alvis Miller & Son Funeral Home is in charge of arrangements for the funeral of Mrs. Barbara Baines. To send flowers or a remembrance gift to the family of Barbara Baines, please visit our Tribute Store. "Email Address" would like to share the life celebration of Barbara Baines. Click on the "link" to go to share a favorite memory or leave a condolence message for the family.